The fourth Jonathan Intégrale collects the Jonathan stories 10,11 and 12. 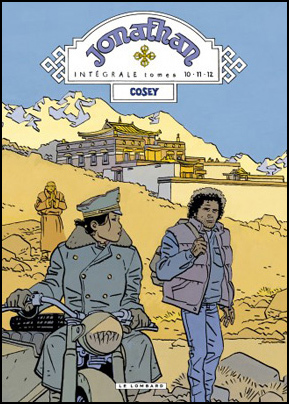 Although the fourth Intégrale collects the two ‘American’ albums of Jonathan, Cosey has chosen for a Tibetan scene for the cover, taken from the 12th Jonathan story. The dossier consists of two parts. 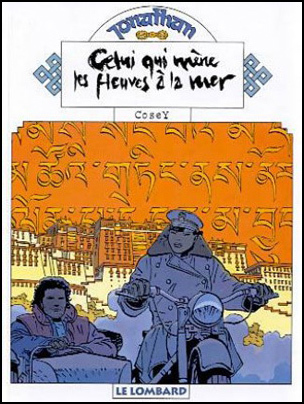 The first one is an article, written by Antoine Maurel, based on an interview with Cosey, the second article is about the Chinese occupation of Tibet, written by Claude Levenson. The complete dossier is illustrated by many photographs and sketches made by Cosey, inviting you to compare with the drawings in the albums. Compare the covers of the original album (1997) and the Intégrale. It seems the Intégrale cover depicts the moment just before or just after the scene of the original cover.